senior and portrait sessions with a modern editorial style. A retro photo shoot for a blonde bombshell. 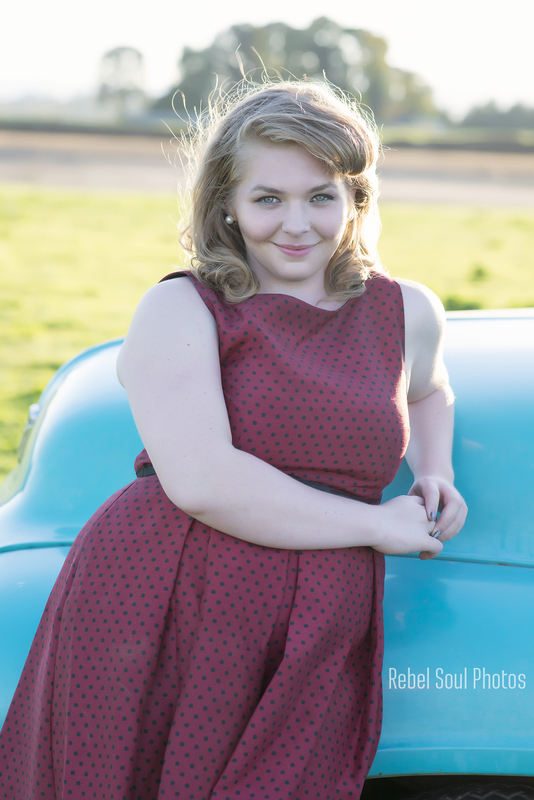 This young lady had one thing in mind for her senior portrait session, retro, and boy did she pull it off. She had picked out some wonderful clothing options to match her theme. Classic halter top dresses. A pair of high-waisted jeans with fitted tops. Of course no 50's style photo shoot would be complete without a stylish leather jacket. Her choice of a criss-cross pattern was just the right touch. All these time period wardrobe pieces combined together to make just the right look. To top it all off, she had the ultimate prop, a 1950's ford truck that her Uncle let her use. It was the perfect set up. Planning a 50's themed shoot is pretty straight forward. I first recommend making a Pinterest board with ideas for hair, makeup, and clothing options. You can follow my board here to get started. Halter top dresses are perfect for a little grace and gumption. High waisted pants and poodle skirts were also key pieced of the wardrobe at the time. Keep your eyes open for something bright or polka dotted and you will be perfectly styled. Also, if you don't have a hair and makeup artist, practice the victory roll hairstyle. It is a classic that is true to the era and is easy to do with a few hair pins and some spray. Of course, no 50's themed shoot would be complete without some killer lipstick so find your shade and rock it. It's nice to E-meet you! Sign up here for rad email updates that will tell you what we are up to, give you tips on how to deal with senioritis, and more! Don't worry we are not monsters! We will never sell you info to anyone. Pinky promise! Awesome, we will keep you updated on all the fun!